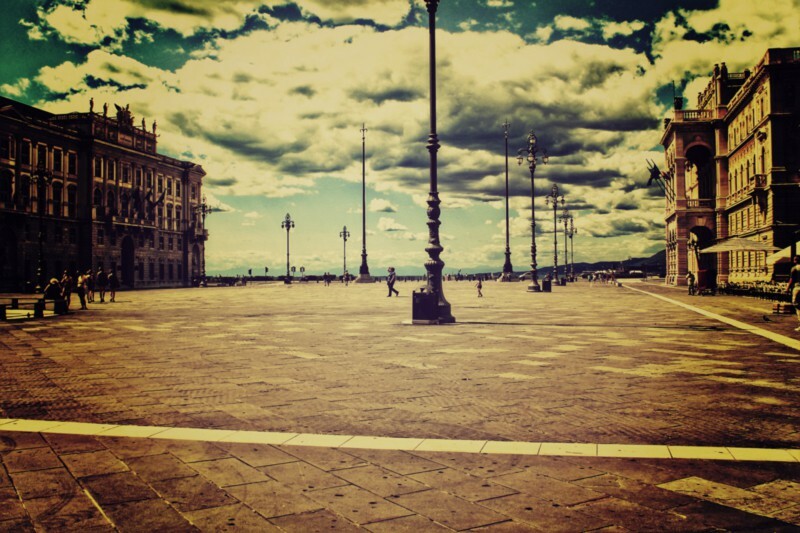 Trieste’s main square is a marvel – a rectangle whose ‘fourth wall’ is the bay of Trieste! Originally called Piazza San Pietro, during the Austro-Hungarian rule in the city it was known simply as Piazza Grande. In 1918 its name was changed to honour the city’s annexation by Italy. The Piazza is dominated on one side by the sea, and on the other by the magnificent Palazzo del Comune, designed by the architect Giuseppe Bruni in 1875. In front of the Palazzo del Comune is the Fontana dei Quattro Continenti built by Mazzoleni in 1750 – a symbolic structure placed by the Hapsburgs to show Trieste’s supposed pivotal role in global trade. The fountain is a good metaphor for the city’s changing place on the world stage – it’s been moved and sidelined several times in its history, for example in 1938 when Mussolini visited the city, and the fountain was removed to create more space for the spectacle. Nowadays the fountain is back in place in the square. 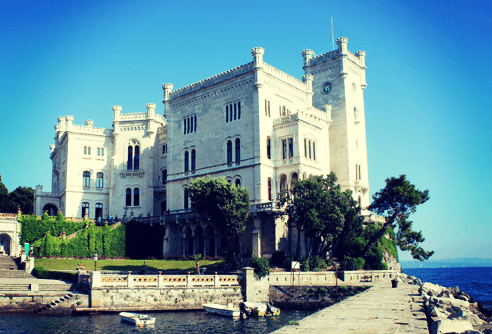 Trieste boasts not one but three impressive castles in its immediate vicinity. Perhaps the most famous, Castello Miramare, was built in 1855 by Maximilian, the Archduke of Austria, as a seaside retreat from the pressing world of global politics. The castle has become a symbol of the town, blending in beautifully with the coastline. Nowadays it plays host to a museum, a park, and a WWF marine centre. In the city centre is the older Castello San Giusto built in the late 1400’s by the Venetians (though only finished in the 1600s), the castle walls here provide a great view of the city, and can be walked around. The castle also plays host during the summer months to various outdoor events. 15km outside Trieste, perched on a cliff, is the dramatic Castello di Diuno, built initially in the 1400s around the ruins of an old Roman Watchtower, the castle was a lookout and defensive position throughout Trieste’s history. Nowadays it is the private residence of the von Thurn und Taxis Princes, but is open to the public for guided visits. 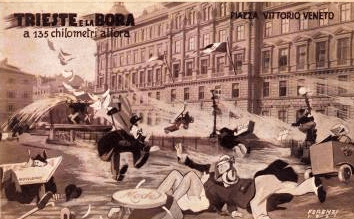 Not to be confused with the polynesian Island of Bora Bora, the Bora is a savage wind that blows down the Dalmation coast and buffets Trieste with an almost supernatural force. It’s certainly uncomfortable, and can blow a person off their feet, but if you like your weather wild and forceful you’ll appreciate Trieste during the winter months. The wind can blow at speeds ranging from 120km up to 200km per hour, and you’ll notice that there are bollards and chains throughout the city to help pedestrians when the Bora hits. Trieste is a crossroads, and because of its international history it has a broad cuisine compared to many other Italian cities. Here you’ll find pasta mixing with Goulash, schnitzels and beer alongside fresh fish, and not forgetting too the City’s traditional soup called Jota, a mix of sauerkraut, pancetta, potatoes, beans, and cumin seeds. The City is famous for its coffee and coffeehouses as well, where you can while away the hours imagining some of the great intellectuals who have passed through the city, ranging from Sigmund Freud and James Joyce, through to Rilke and Italo Svevo, to name but a few. Illy, one of Italy’s most famous coffee makers are based here too. Trieste is surrounded by the Carso or Karst plateau – a limestone plateau that runs from Italy through into Slovenia, characterised by sink holes and caves throughout. The world’s largest show cave, the Grotto Gigante is just a short bus ride away from Trieste, and well worth a visit. The Carso also plays host to the grim monument of the Foibe. These are sink holes where, as resprisals against the fascists Yugoslav partisans murdered many Italians, dumping their bodies into the cavities, after they liberated Trieste. The Foibe have long been controversial in Italy, having been instrumentalised by a number of neo-fascist movements. At the same time, there is a growing consensus that the violence suffered here needs to be recognised – so much so that a national day of remembrance is celebrated each year on the 10th of February. We hope that these five reasons to visit Trieste have been useful for you. Have you been to Trieste? Have you anything to add? Let us know!